Linen yarn is spun from the long fibers found just behind the bark in the multi-layer stem of the flax plant (Linum usitatissimum). In order to retrieve the fibers from the plant, the woody stem and the inner pith (called pectin), which holds the fibers together in a clump, must be rotted away. The cellulose fiber from the stem is spinnable and is used in the production of linen thread, cordage, and twine. From linen thread or yarn, fine toweling and dress fabrics may be woven. Linen fabric is a popular choice for warm-weather clothing. It feels cool in the summer but appears crisp and fresh even in hot weather. Household linens truly made of linen become more supple and soft to the touch with use; thus, linen was once the bedsheet of choice. While the flax plant is not difficult to grow, it flourishes best in cool, humid climates and within moist, well-plowed soil. 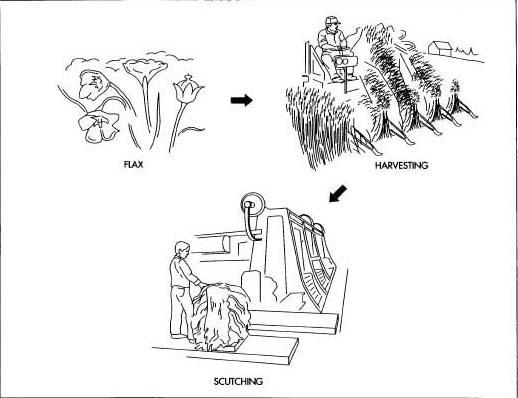 The process for separating the flax fibers from the plant's woody stock is laborious and painstaking and must be done in an area where labor is plentiful and relatively inexpensive. It is remarkable that while there is some mechanization to parts of the fiber preparation, some fiber preparation is still done by hand as it has been for centuries. This may be due to the care that must be taken with the fragile flax fibers inside the woody stalk, which might be adversely affected by mechanized processing. Flax remains under cultivation for linen fiber in a number of countries including Poland, Austria, Belgium, France, Germany, Denmark, the Netherlands, Italy, Spain, Switzerland, and the British Isles. However, the grade of fiber the plants yield in different parts of the world varies. Many believe that Belgium grows the finest-quality flax fibers in the world, with Scottish and Irish linen not far behind. There is no commercial production of linen fabric in any significant quantity in the United States except, perhaps, by individual hand spinners and hand weavers. Thus, the linen fabrics Americans use and wear are nearly all imported into the country from one of these flax-growing and weaving countries. Flax has been cultivated for its remarkable fiber, linen, for at least five millennia. The spinning and weaving of linen is depicted on wall paintings of ancient Egypt. As early as 3,000 B.C. , the fiber was processed into fine white fabric (540 threads to the inch—finer than anything woven today) and wrapped around the mummies of the ancient Egyptian pharaohs. Mentioned several times in the Bible, it has been used as a cool, comfortable fiber in the Middle East for centuries as well. Ancient Greeks and Romans greatly valued it as a commodity. Finnish traders are believed to have introduced flax to Northern Europe where it has been under cultivation for centuries. Both wool and linen were tremendously important fibers in the New World. Relatively easy to grow, American settlers were urged to plant a small plot of flax as early as the seventeenth century. While flax is easy to grow, settlers knew all too well the tedious chore of processing the woody stalks for its supple linen. Before the industrial revolution much sturdy, homemade clothing was woven from linen cultivated, processed, spun, dyed, woven, and sewn by hand. It may be argued that until the eighteenth century, linen was the most important textile in the world. By the late eighteenth century, cotton became the fiber that was most easily and inexpensively processed and woven in the mechanized British and New England textile mills. By the 1850s, linen production had virtually been abandoned in the United States because it was so much cheaper to buy the factory-made cotton. Some New Englanders of Scot or Irish background continued to cultivate some flax for processing into linen used for fancy domestic linens such as bedsheets, toweling, and decorative tableclothes as their ancestors had for centuries. However, most Americans abandoned the cultivation of the plant in this country and instead chose cheap cotton that was carded, spun, woven, and roller-printed for just pennies a yard. Thereafter and until recently, a different variety of flax plant was raised in this country not for its linen fibers but for its seeds which exude a useful vegetable oil known as linseed oil when pressed. All that is needed to turn flax fiber into linen, and then spin and weave the linen fibers into linen fabric is the cellulose flax fiber from the stem of the flax plant. The process for separating the fibers from the woody stalk can use either water or chemicals, but these are ultimately washed away and are not part of the finished material. The manufacture of linen yarn requires no special design processes. All that has to be determined prior to manufacturing is the thickness of the yarn to be spun. That will depend on the grade of linen in production and the demands of the customer. European flax wheel used to spin flax into linen thread. This is a European "flax wheel" used to spin flax into linen thread within the home. Folklore tells us that it was brought by Henry Ford's Irish grandmother to the New World; it was one of the few family keepsakes Ford had from his Irish ancestors. In fact, it was not unusual for the Scots or Irish to bring such wheels to this country. The British Isles have a long and proud linen tradition, and even decades after others abandoned linen production for cotton in the New World the Irish and Scots here tenaciously clung to their linen-making traditions. Ford's grandmother placed unspun flax on the tall, vertical, turned distaff and then push the treadle with her foot to power the wheel. The bobbin and flyer mounted horizontally in the center of the wheel would spin the flax and wind it on the bobbin at the same time. 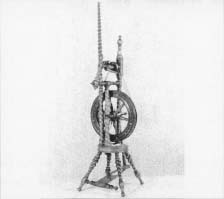 The rather small wheel below the bobbin required the spinner to treadle rafher fast to keep it moving and because of the small wheel this spinning wheel was not a popular style. It is lovely to look at, though, as this flax wheel is rather fancy, with inlaid bone or ivory set within the wheel. Some refer to this type of European spinning wheel as a "castle" or "parlor" wheel because of its lovely inlays and turnings. Once flax is harvested and the fiber removed from the stalks, a scutching machine removes the broken outer layer called shives. seed must be covered over with soil. 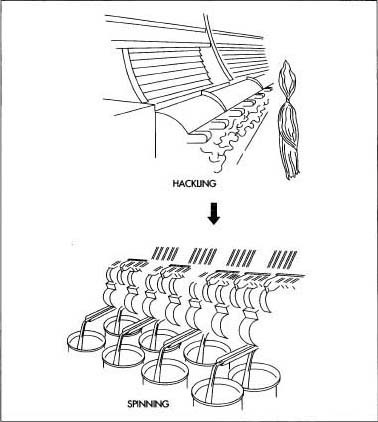 Machines may also plant the seed in rows. 2 After about 90 days, the leaves wither, the stem turns yellow and the seeds turn brown, indicating it is time to harvest the plant. The plant must be pulled as soon as it appears brown as any delay results in linen without the prized luster. It is imperative that the stalk not be cut in the harvesting process but removed from the ground intact; if the stalk is cut the sap is lost, and this affects the quality of the linen. These plants are often pulled out of the ground by hand, grasped just under the seed heads and gently tugged. The tapered ends of the stalk must be preserved so that a smooth yarn may be spun. These stalks are tied in bundles called beets and are ready for extraction of the flax fiber in the stalk. However, fairly efficient machines can pull the plants from the ground as well. The fiber is combed and separated by length. Line fibers (long linen fibers) are spun into linen yarn. rippling, is mechanized in many of the flax-producing countries. 4 The woody bark surrounding the flax fiber is decomposed by water or chemical retting, which loosens the pectin or gum that attaches the fiber to the stem. If flax is not fully retted, the stalk of the plant cannot be separated from the fiber without injuring the delicate fiber. Thus, retting has to be carefully executed. Too little retting may not permit the fiber to be separated from the stalk with ease. Too much retting or rotting will weaken fibers. Retting may be accomplished in a variety of ways. In some parts of the world, linen is still retted by hand, using moisture to rot away the bark. The stalks are spread on dewy slopes, submerged in stagnant pools of water, or placed in running streams. Workers must wait for the water to begin rotting or fermenting the stem—sometimes more than a week or two. However, most manufacturers use chemicals for retting. The plants are placed in a solution either of alkali or oxalic acid, then pressurized and boiled. This method is easy to monitor and rather quick, although some believe that chemical retting adversely affects the color and strength of the fiber and hand retting produces the finest linen. Vat or mechanical retting requires that the stalks be submerged in vats of warm water, hastening the decomposition of the stem. The flax is then removed from the vats and passed between rollers to crush the bark as clean water flushes away the pectin and other impurities. 5 After the retting process, the flax plants are squeezed and allowed to dry out before they undergo the process called breaking. In order to crush the decomposed stalks, they are sent through fluted rollers which break up the stem and separate the exterior fibers from the bast that will be used to make linen. This process breaks the stalk into small pieces of bark called shives. Then, the shives are scutched. The scutching machine removes the broken shives with rotating paddles, finally releasing the flax fiber from stalk. 6 The fibers are now combed and straightened in preparation for spinning. This separates the short fibers (called tow and used for making more coarse, sturdy goods) from the longer and more luxurious linen fibers. The very finest flax fibers are called line or dressed flax, and the fibers may be anywhere from 12-20 in (30.5-51 cm) in length. 7 Line fibers (long linen fibers) are put through machines called spreaders, which combine fibers of the same length, laying the fibers parallel so that the ends overlap, creating a sliver. The sliver passes through a set of rollers, making a roving which is ready to spin. 8 The linen rovings, resembling tresses of blonde hair, are put on a spinning frame and drawn out into thread and ultimately wound on bobbins or spools. Many such spools are filled on a spinning frame at the same time. The fibers are formed into a continuous ribbon by being pressed between rollers and combed over fine pins. This operation constantly pulls and elongates the ribbon-like linen until it is given its final twist for strength and wound on the bobbin. While linen is a strong fiber, it is rather inelastic. Thus, the atmosphere within the spinning factory must be both humid and warm in order to render the fiber easier to work into yarn. In this hot, humid factory the linen is wet spun in which the roving is run through a hot water bath in order to bind the fibers together thus creating a fine yarn. Dry spinning does not use moisture for spinning. This produces rough, uneven yarn that are used for making inexpensive twines or coarse yarns. 9 These moist yarns are transferred from bobbins on the spinning frame to large take-up reels. These linen reels are taken to dryers, and when the yarn is dry, it is wound onto bobbins for weaving or wound into yarn spools of varying weight. The standard measure of flax yarn is the cut. It is based on the measure of 1 lb (453.59 g) of flax spun to make 300 yd (274.2 m) of yarn being equal to one cut. If 1 lb (453.59 g) of flax is spun into 600 yd (548.4 m), then it is a "no. 2 cut." The higher the cut, the finer the yarn becomes. The yarn now awaits transport to the loom for weaving into fabrics, toweling, or for use as twine or rope. Of greatest concern are the chemicals used in retting. These chemicals must be neutralized before being released into water supplies. The stalks, leaves, seed pods, etc. are natural organic materials and are not hazardous unless impregnated with much of the chemicals left behind in the retting process. The only other concern with the processing of linen is the smell—it is said that hand-retted linen produces quite a stench and is most unpleasant to experience. The Irish Linen Guild. Irish Linen: The Fabric of Elegance. NY: Elliott & Nelson, 1945. Jerde, Judith. Encyclopedia of Textiles. NY: Facts on File Inc., 1992. Koob, Katharine. Linen Making in New England. North Andover, MA: Merrimack Valley Textile Museum, 1978. Calhoun, Wheeler and Lee Kirschner. "The Continuous Thread: From Flax Seed to Linen Cloth." Spin-Off Magazine (March 1983): 28-35.
very helpful, it made my project a lot more interesting.